In our home, the kitchen is my favorite room. When touring the house for the first time, I literally giggled from giddiness when I walked into it. I looked around and found that it had everything on my kitchen wish list: large with great flow, center island (with gas cook-top), dishwasher, wall oven, cabinets galore (extended to the ceiling, no less), hardwood floors, and most importantly, turnkey but not brand new. I really wanted a house that was nice and livable, but left room to put our own stamp on it. We had looked at new construction and fully renovated homes, but were hoping for a place that we could play around with without guilt of possibly destroying something. Eureka! We found our gem! Of course, we don't have funds to do any substantial overhaul. But with a little money, a lot of patience, hours on Pinterest, and a few creative surges during baby's naps, we slowly make this house "our home." I fell in love with some incredible Amy Butler fabric I found online. When they came in the mail, I ran wild. Forgive me. I forgot to take some before pictures during my excitement. 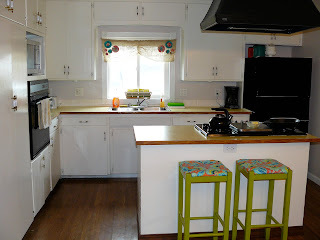 My first project was to give new life to the blah stools we've had for years. They started as this. I sanded them, then did 2 coats of white primer spray paint. On top of that, I did 3 coats of Krylon's Ivy Leaf gloss spray paint. For the seats, I simply cut squares of fabric and flat batting a few inches larger than the seat, then wrapped and stapled the fabric around the seat. Truly an easy project, and they turned out great! Next, I wanted to spruce up the window above the sink. I planted a super easy window herb garden found at Home Depot for $10. Then there was already hardware in place, it was just missing the curtain. So I decided I'd make a valance of sorts. The hubby wanted to be able to see out the window at all times, so I couldn't obstruct the view with a whole curtain. Plus, there's an accordion shade to let down if we want privacy. Using the hot glue, I made a seam for the rod to go through. I love hot glue! Next, I decided I'd try my hand at fabric flowers to use as embellishments. Searching Pinterest, I found a great tutorial here. I cut countless rounds out of my fab fabric and hot glued away! After making flowers of varying sizes, I glued them onto my burlap valance and hung it up! I rather like how it turned out for basically no $. I already had the hardware, glue and burlap and the fabric was really just scraps from another project. There isn't a center to the flowers yet, as I haven't found a button or bobble I like. Rummaging through secondhand shops should produce the lil treasures soon I hope. - Repaint the cabinets. They are an antique white right now, so we'll make them a bright white. - Refinish the floors. We'll keep the color, but make them nice and shiny. - Replace the countertops. 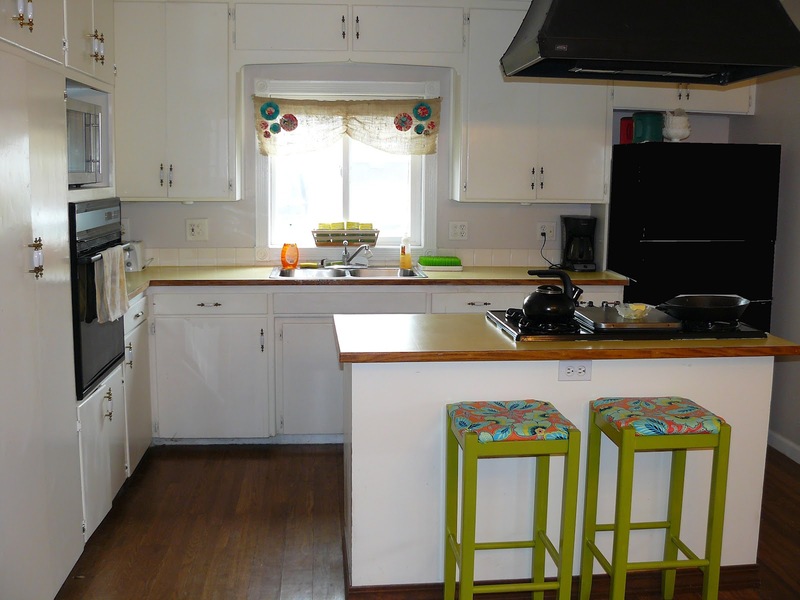 I may try Rustoleum's countertop refinishing products, but will likely just replace it with butcher block or something. Since this isn't our forever home we won't be putting big chunks of change into it. So the creative, small perk-ups are where I'm putting my energy. It's a slow but fun process!